Ever since I started down the Craft Beer road a few years ago, I have had a difficult time embracing the Pumpkin Ale beer style. While many of them smell delicious, I have found the actual flavors to be somewhat disappointing. Where does all that spicy goodness in the nose go? Is this a case of my expectations being too high, or do I just not understand what Pumpkin Ales are all about? Let’s face it, beer tasting, like virtually everything else in life, comes down to personal preferences. That being said, I am always on the lookout for a new and interesting beer to try, so when I hear people rave about a particular beer, I occasionally get caught up in the enthusiasm and head out to do some beer hunting so that I can see for myself what all the fuss is about. 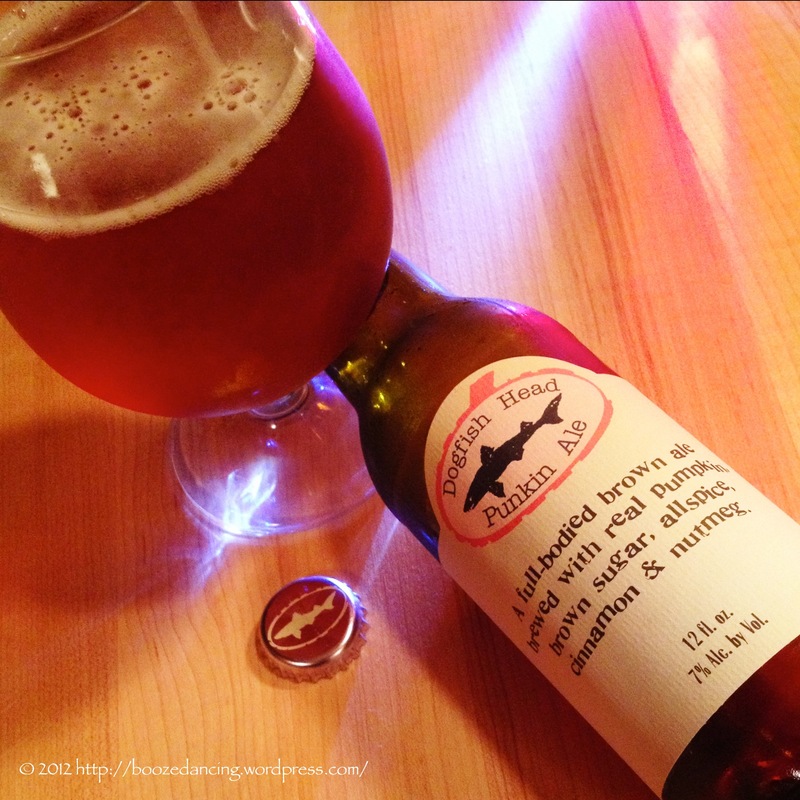 One such beer that keeps popping up on the interwebz at this time of year is the Dogfish Head Punkin Ale. I haven’t had the Dogfish Head Punkin Ale in over three years. When I first had it, I was tasting many a Pumpkin Ale, but while I found most of them to be quite disappointing, I remember this one being quite good. When I ventured to The Foodery for a mixed six pack this past Friday, The Punkin Ale was on my shopping list, so when I saw it in the beer fridge, I decided to pick up a bottle. Appearance: Clear auburn color. Oodles of small, fast rising bubbles. Quickly dissipating foam that tops off at about an inch, but then disappears completely. Very little lacing. Aroma: The label on this beer does not lie. They say it’s brewed with real pumpkins, brown sugar, allspice, cinnamon, and nutmeg, and they aren’t kidding. It’s all there, though not as overpowering as you would think. All quite subtle. Not much in the way of hops. Taste: Light mouthfeel and carbonation. Starts off with lots of roasted maltiness that’s backed up with all of those pumpkin pie spices, but again, in a very subtle way. A bit of bitterness kicks in at mid palate. The moderately high alcohol content shows up at the end and leads you to a mildly spiced bitter finish. Slightly vegetal aftertaste. Guess that must be the fresh pumpkin talking to me. As far as Pumpkin Ales go, the Dogfish Head Punkin Ale is definitely one of the better ones that I’ve had. It’s very smooth and easy drinking, but with just a hint of booziness to remind you that it has a moderately high alcohol content. While I definitely enjoyed this beer, that doesn’t mean I loved it. For whatever reason, I still can’t wrap my head around this beer style. If you’ve had this beer, please share your thoughts, and provide me with further Pumpkin Ale insights. Thanks in advance for all your help! I find fruit beers to be a difficult thing to do correctly, too much fruit and it can be overpowering, too little and you have simply served me a pale ale which doesn’t live up to the hype. Sometimes they are too sweet and I feel like I’m drinking a wine cooler. It is hard to find that middle ground of having flavor and still maintaining some balance. I want it to be both a beer and to have a nice fruity flavor. I think that this beer does find that middle ground, maybe not my favorite pumpkin beer but still one of my top four (I’ve had a lot). It has a nice flavor that makes you think you are actually drinking a spiced pumpkin bread and a beer at the same time. A nice one to pick up and enjoy several every year, but a case would be too much for me. The fruit beer exception to the “not too much fruit” rule would be a lambic (or similar) where tartness and “funk” are used to balance out the overly sweet and fruity flavors. I agree with your assessment 100%! It’s a question of balance and I am on board with the whole lambic thing. It’s fruity beer done right. If you like that sort of thing, which I do. I JUST had a Southern Tier Pumking at The Pourhouse and I have to admit, THAT is what I expect a Pumpkin beer to be. They went big with it and I respect them for it. Punkin Ale is good, but it just doesn’t go far enough for my taste. Again, this may be a case of me just not understanding the style. Yes, the Southern Tier Pumking is very nice, I think for me the key to a good pumpkin beer is the spices. They are what provides the balance to the fruitiness and sweetness (rather than merely moderating the amount of fruit), The spices do the job that is done by the tartness and the funk in a lambic (which may also have spices). You can make an apple pie with nothing but apples and sugar and make a kid happy, but I’m bored by the second bite. However, with the right spices apple pie is delicious. They’re just as important in a fruit beer. Outside are all of the signs of autumn, the cold is here, I’m wearing long pants and long sleeves, the days are short, summer fun is over… but wait here is a beer that has some of the same aromas that are in the air, falling leaves moist on the ground, a nice earthiness in my beer! Now autumn isn’t so bad, maybe it is just a gateway to fireplaces, ski lodges, mulled wine and Christmas beers! That is what I want my pumpkin beer to do! Funny that you mention Christmas Beers. I don’t usually care for them either! Interestingly enough, I’m ok with a fruity beer (I’m looking at you Festina Peche, Cerise, and Apricot Wheat!). Pumking manages the spice really well. It’s kind of over the top, but for whatever reason, I think it works. Evil is too strong of a word. I’m with you on the overall “meh” factor that I get from most of them, but there are some good ones out there.